We were delighted to recently be asked to undertake some renovation work on the beautiful presbytery building at St Columba’s RC Church on Upper Gray Street in the leafy area of Newington in the south side of Edinburgh. Having previously replaced a number of the church’s windows with bespoke casement windows it was great to be asked back to undertake another project. A fantastic historical building at the heart of the local community, the church felt that the kitchen area was in need of upgrade, modernisation and extension and they consulted with us with regard to this refit. It was important to retain original features and character of the building, and also to keep the project running efficiently so that any disruption to the busy daily life of the church was kept to a minimum. The church was looking to replace their tired kitchen and make a bigger and much more modern working kitchen for the church members and community groups who regularly rely on the space to cater for their various meetings and events. Working to the architect’s drawings we were able to create a larger working space by removing a brick walled cupboard to extend the kitchen space, and also by changing positions of windows and doors meaning the space could be used in a more efficient arrangement. 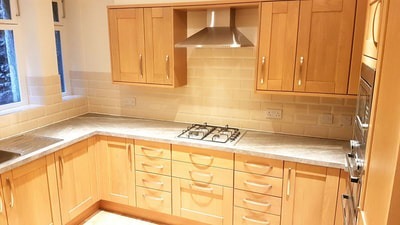 The church opted for a high quality, durable and attractive solid wood oak fitted kitchen which we installed along with new integrated appliances. The wiring was in need to modernisation so we moved the fuseboard to a more practical position and also upgraded the electrics. In order to make sure the kitchen was nice and bright, we lowered the ceiling and fitted LED down lights which means all areas are bright and accessible to the users. In line with the historical feeling of the church we then installed new double glazed timber windows ensuring warmth, sound proofing and energy efficiency for the room. We finished off the project by fitting new cornicing, plastering all of the walls as well as the new ceiling and added new wall tiles and a lick of paint. The floor was finished with heavy duty twin floor vinyl, tough enough to cope with the high number of people using the kitchen space. Above are some pictures of the kitchen before, during and after our renovation. We regularly provide our contract joinery and building services in a non-domestic setting and are experienced in working with businesses and organisations to help them make the best of the space they have. We can provide all trades and manage your project from beginning to end, leaving you free to focus on your own business. If you’re thinking about making changes in your premises, get in touch.